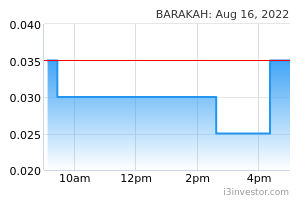 Barakah Offshore Petroleum Bhd is a Malaysia-based investment holding company. It is involved in the oil and gas industry in Malaysia. The company, through its subsidiary, is engaged in providing and carrying out onshore and offshore contracting works, such as pipeline pre-commissioning, commissioning and de-commissioning, pipeline installation, fabrication, hook-up, topside maintenance and other related activities. It offers various services, including pipeline services, offshore transportation and installation works, hook-up and commissioning, onshore construction, underwater services and chartering of marine vessels and equipment. Moc Nokin Gagasan nadi uptrend today! KiraL pass few day stable at range 0.95-1.00, be steady. KiraL Current BARAKAH value is 1.00, is reasonable price. 0.95 is consider worth to buy. KiraL 1.00 is reasonable price. Anything below 1.05 is a bonus. Buy and keep 1st. Moc Nokin No bad, keep maintain at around 0.95-1.00. Flyinghorse Barakah will fly to the moon tomorrow. The best action taken for the good of the company. Ron90 fundamentally strong, only the major issue was the stupid CEO, which i am glad, already gone. I am pretty sure, he was forced by the creditors as one of the requirements for them to accept the restructuring plan. Moneymore Ok, tomorrow gap up 0.15 finally restructure plan moving ahead! 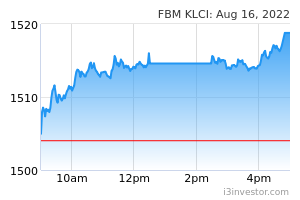 BigPro Should be Gap Up today..
KiraL Time to fly, spamming to buy! Always support this potential stocks. bigfund Bear and bull is fighting. See who win. Pisex theres alot of changes in shareholders. Anyone knew what happened? BigPro Market sentiment still bad... after market back to normal, sure will fly high. avatarsnipe Yea.... still at holland now.... hahaha. zing963 Does this news related to Barakah also? BigDaddyCool 90 days grace period is over.Nik Hamdan resigned.Company is in huge losses with debt burden.How the share price will increased will depends on the new management team.NH is history,.The only way is to liquidate its assets where i doubt so.2nd that best is to issue new rights issues.3rd a white knight coming in to become the largest shareholder with new project.But I guess Samling group is in a euphoria as the balance sheet is a disaster!! 劉尹光 dropping,... ala ... huge loss..
Pisex “BEWARE: BURSA MALAYSIA SCAM ALERT! YOU ARE BEING SCAMMED! Whatever the case, those of you who’ve been hurt by the actions of these sharks can file a complaint with ALL of the above agencies. Include the Usernames of those who are obviously agents of these scammers who come to these forums to talk down the stock and help the syndicate/scammers drive down the prices! Pisex Share your thought please.. Seems like we were the victim now. If we were then I hope they all burnt in hell..